Thanks to the new healthcare reform law, the insurance industry is undergoing a big transformation. The federal government is now requiring insurers to open the coverage gates, remove the benefit caps, and reduce cost-sharing amounts for policyholders. Limiting the waiting period for new coverage: The longest an insurance company will be able to make you wait before your policy becomes effective is 90 days. Guaranteeing coverage and renewal: Health insurers won't be able to deny you new coverage or renew your existing coverage because of your past or current medical conditions, genetic testing results, or history as a domestic violence victim. Ending of long-standing rate rules: Insurers won't be able to charge you more because of your medical history or current health status, genetic information. Insurers will still be able to take into account your age, geographic area, family composition (such as number of people), and tobacco use when deciding how much to charge you for your insurance coverage. Limiting small group plan deductibles: If you're an individual covered by a small group plan, your deductible will be capped at $2,000. The cap will be $4,000 for a family. These limits will take effect in 2014. Mandating coverage for preventative services: If you plan to keep your current coverage for the foreseeable future, you'll have to wait a while to take advantage of this benefit. All new private insurance plans must provide coverage for preventative services and immunizations without charging you a co-pay or deductible. However, all private plans won't be required to provide you with this coverage until 2018. The ACA, also known as the Affordable Care Act or "Obamacare," expands prescription drug benefits and helps hold down premium costs for Medicare recipients. Together, Medicare and Medicaid currently insure nearly 93 million Americans, but these changes will also make Medicare accessible to more Americans. Complete closure of the "donut hole": By the end of the decade, you won't have to worry about navigating through the Medicare prescription drug coverage gap known as the donut hole. On top of the 50 percent brand­ name drug discount pharmaceutical companies were required to provide beginning in 2011, the government has now begun phasing in additional subsidies for both brand name and generic drugs until the donut hole is closed in 2020. Medicare Advantage cuts: The government reduced the amount of subsidies it provides for Medicare Advantage coverage, so if you have a private Medicare Advantage plan to help you pay for health-related expenses not covered under traditional Medicare, you may have seen some reductions in your coverage beginning in 2012. The plans can't reduce benefits for your basic health needs, but they will be able to cut coverage for services Medicare doesn't consider primary. Premium changes for Medicare Parts 8 and D: From 2011 through 2019, the premiums you pay for Medicare Part B coverage (doctor's visits, medical equipment, etc.) won't go up. However, if your annual income is more than $85,000 (for an individual), or $170,000 (for a couple), the government is going to reduce the amount of Medicare Part D premium subsidy you receive to help pay for prescription drugs. Reduction in catastrophic coverage threshold: Beginning in 2014, Medicare will reduce the amount of money you'll have to pay out of pocket before your Medicare Part D catastrophic prescription coverage kicks in. However, the reduction will only last five years, until 2019. Changes to Medicare Part D cost-sharing: In 2012, Medicare made the costs you pay out of pocket for home and community-based care the same as the amount you'd pay if you received care in a hospital, nursing home, or other health-care institution. Most of the Medicaid changes outlined in the healthcare reform law center around cost containment and rewarding doctors and hospitals that provide quality care to Medicaid beneficiaries. However, in 2014, a landmark change in the 45-year-old program is slated to take effect: All adults under age 65 who meet certain income guidelines will be eligible to enroll in Medicaid. (Some states instituted the new Medicaid enrollment guidelines early. new law opens up the program to also include adults without children and pregnant women. Enrollees will still have to meet certain income guidelines. Specifically, household incomes won't be able to exceed 133 percent of the federal poverty level (FPL). FPL is $10,830 for an individual and $22,050 for a family of four. Some parts of the Affordable Care Act have already been implemented. However, several of the more groundbreaking provisions of the healthcare law- some of which will affect the greatest number of Americans­ won't go into effect until2014. In the interim, federal and state officials are working with leaders in the health and insurance industries to restructure our nation's healthcare system. That restructuring means most Americans will be required to have health insurance and most businesses will be required to offer it to their employees. It also means the creation of another kind of insurance plan called a health insurance exchange. The government will require most Americans to have health insurance by 2014. The government has enacted this provision as a way to get healthy people who don't feel the need to pay for coverage to buy insurance. That way, the healthy people can help fund the cost of people who require more medical care. If you're penalized, the amount you'll be fined will go up each year for the first three years. In 2014, you'll pay $95 or 1 percent of your taxable income, whichever is greater. In 2015, the fine will be $325 or 2 percent of taxable income, and in 2016 the penalty will be $695 or 2.5 percent of income. Each year after 2016, the government will refigure the fine based on a cost-of-living adjustment. For example, if your income is 133 percent of FPL, you won't have to pay more than 2 percent of your income in premiums. At the high end of the range, if your income is 400 percent of FPL, your premium costs won't be more than 9.5 percent of your income. FPL is $10,830 for an individual and $22,050 for a family of four. You could also receive a cost-sharing credit to help reduce your out-of-pocket expenses for deductibles and co-pays. Like the premium credits, the amount of cost-sharing credit you receive will be based on your income in relation to FPL. Basically, the new healthcare reform law provides federal funding for states to establish American Health Benefit Exchanges and Small Business Health Options Program (SHOP) Exchanges. Whether you're an individual or a small business owner, these exchanges are supposed to serve as an easy, cost­ affordable way for you to get health-insurance for yourself or your employees. From a consumer perspective, the exchanges are about power in numbers. For instance, the American Health Benefit Exchanges are supposed to provide access to lower cost insurance plans for the uninsured because they allow individuals to join together to create a large pool of insured people. Usually, in the insurance world, the more people who are insured under any one plan, the lower the premiums for that plan. The SHOP exchanges are where business owners with fewer than 100 employees can join forces with other small businesses to try and get the best coverage at the best price for themselves and their workers. Even if you're offered insurance through your employer, you could still opt to purchase insurance through the individual exchange if your income meets certain FPL guidelines. Both the individual and small business exchanges are supposed to give you access to plans that have four tiers of benefits: bronze, silver, gold, or platinum. There will also be a catastrophic plan for people under 30 and for those who are exempt from mandated coverage. States don't have to set up the exchanges. If a state chooses not to, the federal government can come in and create them. On November 6, 2012, Missouri voters passed a ballot measure blocking Governor Jay Nixon (D) from establishing an exchange via Executive Order.1 Legislation establishing a state-based health insurance exchange failed in both the 2012 and 2011 legislative sessions. While the Governor initially supported running a state-based exchange, he announced the state would default to a federal exchange in 2014. Exchange plans will be offered in a tiered format named after metals: bronze, silver, gold and platinum. Bronze plans will have the lowest monthly premium, but will also have higher deductibles and cost sharing provisions(co-pays). Healthcare.gov: Essential health benefits (accessed October2012). Healthcare reform (what some refer to as "Obamacare") is now the law of the land. The legislation means the American health system is undergoing an overhaul the size of which hasn't been seen since Medicare and Medicaid were created in 1965. The law calls for insurance industry reforms, mandates healthcare coverage for most Americans, creates more insurance options, and expands Medicaid. Although the broadest of the bill's provisions won't take effect until2014, Americans may have already noticed some changes starting in 2010. Here's a look at the new healthcare reforms already in place. Creation of high-risk pool: If you are an adult who hasn't had health insurance for six months or more and you have a preexisting condition, you may now enroll in a high-risk insurance pool. The premiums you pay will be partially subsidized by the government. The program will be eliminated when the new healthcare exchanges are up and running in 2014. Formation of retiree reinsurance program: If you're a business that provides health insurance for retirees older than 55 who aren't yet eligible for Medicare, you can be reimbursed for 80 percent of your retirees' health claims. The payback applies to claims between $15,000 and $90,000. The program will be phased out once mandated health coverage becomes effective in 2014. Coverage for children with preexisting conditions: Insurance companies can't deny coverage for your child because the child has a preexisting condition. Increase in age for dependent coverage: You are able to keep your dependent children on your individual or group health plan until they reach age 26. Mandated preventative care coverage: If you obtain coverage under a new, private insurance policy, that policy must cover the cost of your preventative care without charging you a co-pay or a deductible. By 2018, all plans will be required to follow suit. Elimination of coverage caps: Your insurance provider can't set a lifetime or annual benefit limit on your health group or individual coverage. Ban on coverage rescission: Insurance companies are prohibited from voiding your insurance coverage. The only exception is if you provide the company with fraudulent information. Rebate for Medicare prescriptions: If you're a senior on Medicare whose prescription coverage has fallen through the infamous prescription "donut hole" (coverage gap), you will now receive a $250 rebate to help offset your out-of-pocket costs. Improvements in Medicare designed to close the prescription drug donut hole are slated to be phased in over the next several years. Tax credits for small businesses: If you employ 25 or fewer employees and pay for at least half of your employees' health insurance, you could be eligible for a tax credit of up to 35 percent of the premiums you pay. The tax credit will apply to tax years 2010 through 2013. Additional donut hole help: If you're on Medicare and in the donut hole, you can get your prescriptions for brand-name drugs filled at a 50 percent discount. Expanded Medicare preventative services: If you receive health care though Medicare, your prevention care is covered without co-pays or deductibles. Optional Medicaid enrollment expansion: Your state had the option of instituting new, more inclusive Medicaid enrollment guidelines before the mandated 2014 start date. All individuals under age 65, including adults without children, pregnant women, and children whose household incomes don't exceed 133 percent of the federal poverty level (FPL) are eligible for enrollment. FPL is $10,830 for an individual and $22,050 for a family of four. Additionally, states will have to continue administering CHIP, Children's Health Insurance Program, at current coverage levels. Medicaid coverage for at-home care: If you have two or more chronic conditions or one serious, persistent mental health condition, your state has the option of allowing Medicaid to cover the health care you receive at home. Reduction in health-savings account coverage: Your health savings account can't reimburse you for your over-the-counter, non-prescription medication purchases. Well ness program grants: If you're a small employer and you establish a wellness program, you may receive grants to help institute and maintain that program for up to five years. By 2014, the only businesses not at risk for being penalized if they don't offer health insurance to their employees are businesses with 50 employees or less. Subsidies serve as insurance enticement: Even if you don't have to insure your employees, the government is going to try and coax you into it with a series of subsidies to help you pay your premiums. If you purchase insurance for your employees through SHOP, you might be eligible for a tax credit equal to up to 50 percent of the cost you pay toward your employees' health insurance. That credit will be paid out for two years. 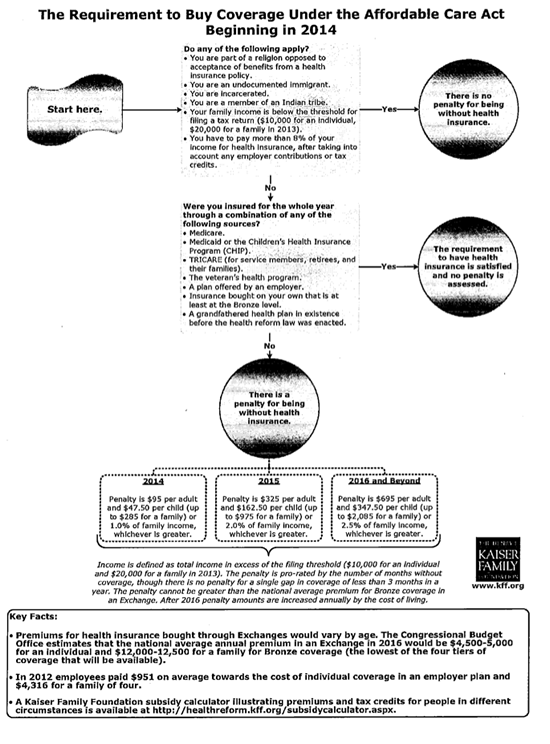 Penalties for not insuring: If you don't offer health insurance and you're an employer with more than 50 employees, if one of those employees is a full-timer who receives a premium subsidy because he participates in an exchange, you'll have to pay a fee of $2,000 for every full-time employee you have (although penalties for the first 30 are waived). Penalties even if you do insure: Even if you offer health insurance, if one or more of your full-time employees chooses not to participate in your insurance plan and, instead, opts for an exchange plan that allows them to receive a premium credit, you could still be penalized up to $3,000 for each employee receiving a subsidy. You can avoid being penalized for the number of employees who receive insurance through the exchange by providing each one of them with a free choice voucher to help offset the cost of their premiums. Automatic enrollment required for large employers: If you employ more than 200 employees, the new law will require you to automatically enroll them in your insurance plan. However, an employee may choose not to participate. The Affordable Care Act does not require businesses to provide health benefits to their workers, but larger employers face penalties starting if they don't make affordable coverage available. Enforcement of those penalties will begin in 2015, a year later than originally scheduled. 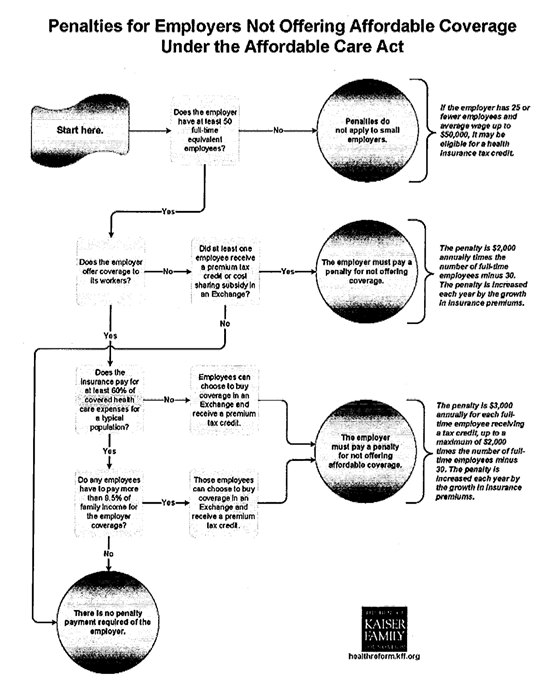 This simple flowchart illustrates how those employer responsibilities work.